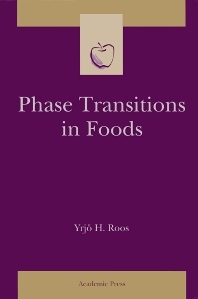 Assembling recent research and theories, this book describes the phase and state transitions that affect technological properties of biological materials occurring in food processing and storage. It covers the role of water as a plasticizer, the effect of transitions on mechanical and chemical changes, and the application of modeling in predicting stability rates of changes. The volume presents methods for detecting changes in the physical state and various techniques used to analyze phase behavior of biopolymers and food components. This book should become a valuable resource for anyone involved with food engineering, processing, storage, and quality, as well as those working on related properties of pharmaceuticals and other biopolymers. Prof. Roos is associated with the University College Cork, Ireland. His teaching and research activities involve food materials science including glass transition. More specifically, his main research interests include crystallization, freezing, dehydration, encapsulation, reaction kinetics, state transitions and water relations of food and biological materials. He is a known authority in developing and applying glass transition concept in various food systems. He has authored one book Phase transitions in foods and two co-edited books. He has published more than 200 papers including book chapters which are cited close to 8000 times (2014). Prof Roos has appeared on ISIHighlyCited.com as a highly cited scientist in the field of Agricultural Sciences. He is President (2013-) and an elected member of the Central Committee of International Symposium of Water in Foods (ISOPOW) and member of several international scientific organizations. Yrjo¨ H. Roos is Professor of Food Technology and Head of School of Food and Nutritional Sciences, University College, Cork, Ireland. He holds MSc and PhD from University of Helsinki. He has extensive experience from appointments in the Dairy Industry and universities in the USA, Finland and Ireland. His research in Food Science and Engineering covers Physical Chemistry of Foods and Food Materials Science, particularly Phase and State Transitions in Food Processing and Storage.